Up for pure taste and outstanding aroma? 4 Aces Pipe Tobacco has all the best qualities for enthusiastic pipe smokers, but at a fraction of the cost! 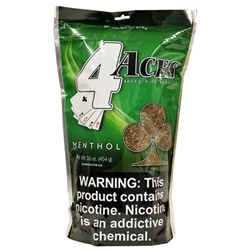 Get more bang for your buck with our three exclusive flavors of 4 Aces pipe tobacco. This tobacco is enough to take you on a joyful ride every time! Carefully packed to maintain the freshness and quality of the ingredients. Available in a 6 oz bag or a 16 oz bag at a super low price to fit your smoking needs!